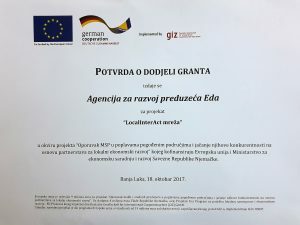 At the ceremony organized within the joint EU and German Government Programme for Local-Self Government and Economic Development in BiH – EU ProLocal, implemented by GIZ, Eda was awarded grant certificate for the project ‘LocalInterAct Network’. 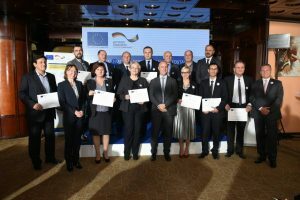 The ceremony was attended by the Deputy Head of EU Delegation to BiH, Mr. Khaldoun Sinno; the Deputy Minister of Foreign Trade and Economic Relations of BiH, Mr. Mato Franjicevic; the Minister of Industry, Energy and Mining of Republika Srpska, Mr. Petar Đokić; the Secretary of the Federal Ministry of Development, Entrepreneurship and Crafts, Mr. Jozo Bejić; the EU ProLocal Program Manager, Ms. Karin Hoerhan, as well as grant beneficiaries. The overall objective of the project “LocalInterAct Network” is improvement of competitiveness of export-oriented sectors and enterprises, with improved location competitiveness of the area. Established mechanisms for advanced municipal and inter-municipal support for exporters based on the Small Business Act is specific objective of the project. The project will be implemented in partnershipo with municipalities Derventa, Prnjavor and Laktasi, and will be directed primarily towards export oriented enterprises in metal and wood processing industry. 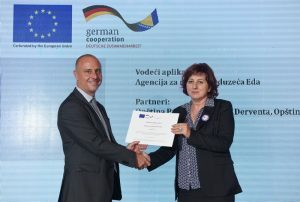 The project “LocalInterAct Network” is co-financed by the European Union within the joint programme of the European Union and the German Government for local self-government and economic development in BiH – EU ProLocal, which is implemented by GIZ. The project budget is BAM 210.814, co-financed by the European Union in the amount of BAM 168.651. More information about the project is available here.